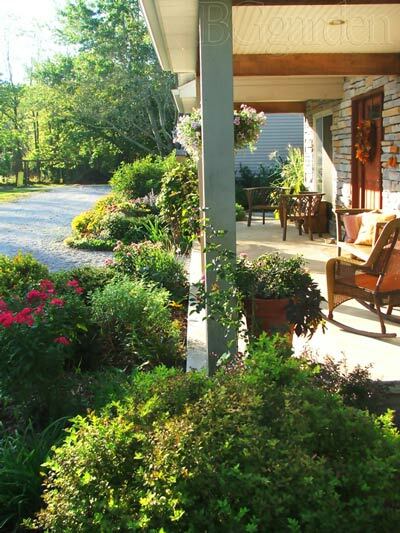 Zone 5 perennials provide generous charm around this Midwest country porch. We are truly honored to feature Brenda, a freelance photographer and amazing midwest gardener. She is the author of BGgarden where she shares her journey in Midwest gardening. 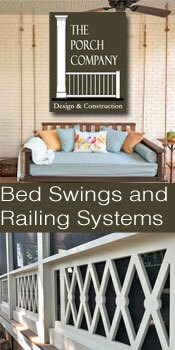 Brenda's porch was featured on the May 2010 cover of Lawn and Garden Retailer Magazine. What an honor and testimonial to the beauty of her porch and her zone 5 perennials and amazing perennial garden ideas. Mary: Brenda, please tell us a little bit about yourself, your gardening and your blog. 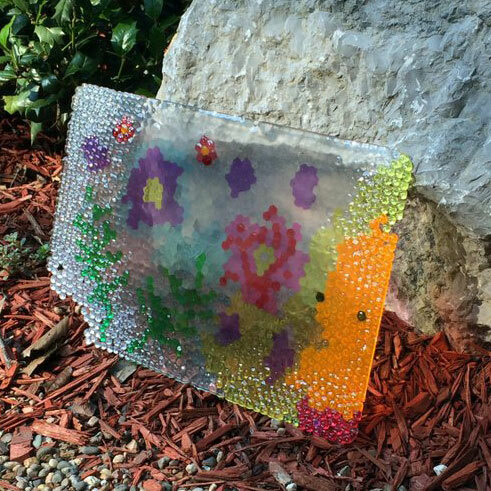 Brenda: My background is in Fine Arts and I really love gardening especially here in my native Midwest home. I aspire to share the aspects of growing green and that is why I created the BGgarden web site. Through my photography over the past couple of years, I have been sharing life in the garden. 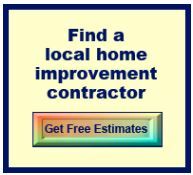 I want to share garden centers in our area on my blog - in hopes of helping our economy. I began gardening about 17 years ago when we purchased our first home - after killing the gardens in that yard. I seriously didn't realize what I was doing and unfortunately killed just about everything. Neighbors walked past my new home and said, "I feel bad for the previous owner. He must be heart broken to see how you destroyed his gardens." I was determined to make this house a home inside and out. After about 10 years, I began to feel confident about my gardens. By the time we moved in 2003 people would do their daily walk past my house just to see the gardens. Brenda: Seven years ago we moved our family to our dream location in farm country Ohio. At signing of the home purchase I can honestly say the only thing I remembered about the home was there were 3 bedrooms, a huge yard and a beautiful front porch. Brenda: In the past 7 years about the only thing we have not changed is the front porch. 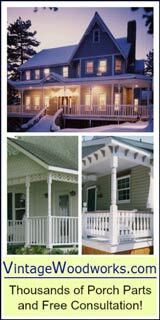 You can tell from the images above that both home owners loved the front porch but the new owner ( me) loves to invite the garden into the home. Mary: Please tell us about your porch. Brenda: The front porch at the BGgarden is a rock front 27' x 16' open porch that allows our guests to go from our country gardens to the main room of our home. 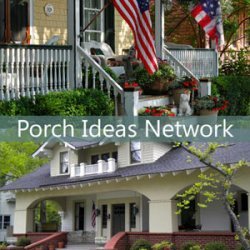 Mary: In what ways do you and your family use your porch? Brenda: The front porch is a place that allows our family to relax and enjoy the view of the front gardens at our home. Most importantly, the front porch was designed to let our guests feel welcome so it is open almost as if it is reaching out for a hug! We have a few other 'sitting' areas located on our property but the front porch provides a quilt to wrap us in at the beginning and end of the day. 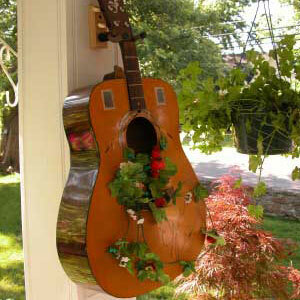 Mary: Your porch is dressed up with a most beautiful Ohio wildflower garden. Please tell us what wildflowers you have included and how you planned your garden. 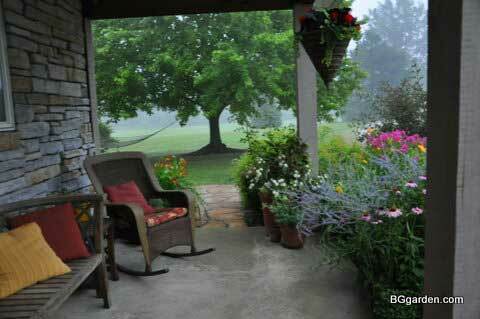 Brenda: The gardens surrounding the front porch were designed to be enjoyed from all sides of the porch. When you sit on the wicker and wood furniture we have on the porch you don't get the back view of a landscaping. It is constantly changing because I am always finding new perennials that work best in that full sun garden. A list of zone 5 perennials (specifically flowers) you might find in my Ohio garden are: Echinacea - purple and white, Rudebeckia, Coreopsis, Chrysanthemums, Hemerocallis, Heirloom iris, Salvia, six different varieties of Sedum, Clematis, just to name a few of the flowers in my 'garden quilt'. I also include shrubs in my gardens for green most of the year. Some of my shrubs are the birds nest yew, Coppertina, Weigela and the Spirea. Mary: What are some zone 5 perennials of Ohio wildflowers that you recommend growing for your region? 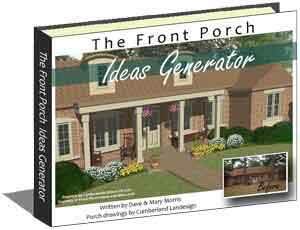 Brenda: Just about everything in my front porch bed I would recommend any new gardener in the Midwest. Most of the blooms are perennials and are low maintenance. The only things I have to water in that garden are the containers and the moss rose (annual) that I mix in the with the sedum ground cover along the front border for all summer color. 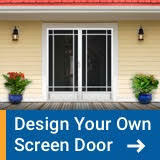 Mary: When it comes to adding curb appeal, what tips do you have for landscaping around the front porch? 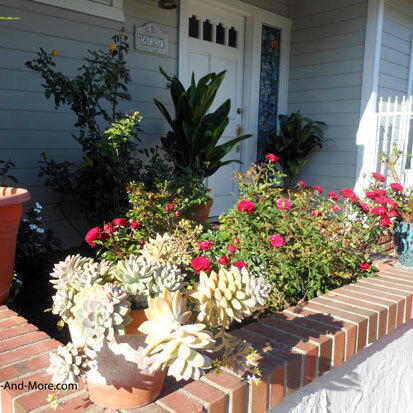 Brenda: My current garden is in the country so the front porch garden is by 'invite' only. When I lived in town I always would add shrubs that provided color to my front landscaping presenting an invite to come and enjoy! New varieties of low growing Spirea and Weigela are great mixed in with some shorter yews like birds nest. I would mix my flowers around the shrubs so if I couldn't take care of the flowers or if someone who was not a gardener bought my home they would still have color from the shrubs. Be careful not to add too much nor too little! Stand on the curb and look at what the neighborhood can see. Does your garden invite people to come visit? Mary: Anything else you would like to add? Brenda: Thank you for allowing me to share a little bit of my home and garden with you, Mary! Mary: You are most welcome, Brenda. 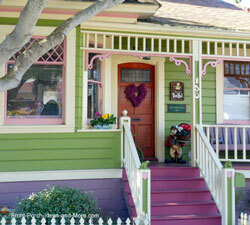 It is our pleasure to share your beautiful porch with our readers. How did you get your photography featured on the front cover of Lawn & Garden Retailer Magazine? 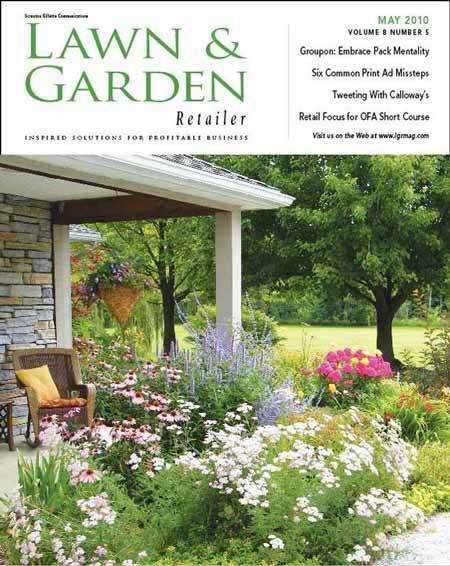 Brenda: I was asked by the managing editor of Lawn & Garden Retailer Magazine if she could use one of my images on their May Cover. She has been a fan of my photography for the past year on social media networks like Facebook and Twitter. 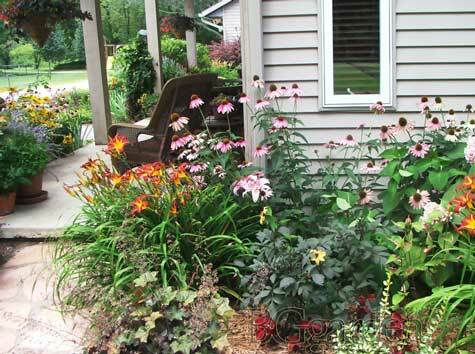 Dave and I are most appreciative of Brenda's front porch pictures and gardening ideas with zone 5 perennials. 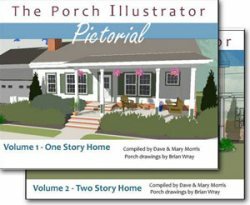 Thank you so much for sharing your front porch story with us, Brenda.